With all the excitement surrounding one of the most widely celebrated festivals in India I couldn’t help but reminisce on the Deepavali’s past in my life. And yes I refuse to call it Diwali. I grew up celebrating Deepavali and I will continue to address it that way 🙂 Much like Chennai and Madras I guess. Growing up with cousins has one distinct advantage, a healthy spirit of competition. Much of my childhood was spent in Kovai in a house with plenty of space outside than inside. Deepavali preparations began well in advance with new clothes, smell of sweets and savories being prepared at home. Specially the Deepavali marundhu , which was a concoction of medicinal herbs cooked in ghee and stirred in with jaggery syrup. I loved it. It was supposed to help with indigestion which was bound to happen with huge quantities of sweets and mixture going into the body before 7:00 AM on Deepavali day. On the actual day, thatha would wake us up and surprisingly that was one day we would all rush and compete to be the first to be ready. Seating us on a palagai with kolam on it, thatha would take the nalla yennai (Sesame oil) heated with black pepper seeds in it all set and ready from the previous day evening and apply some right at the top of the head and massage it in. In turns all of us would be anointed with the said oil and queue up for the bathrooms to have our “Ganga Snanam”. Akay of Lemon and Chillies has a nice post on Deepavali explaining this custom. Eyes red from the shikakai powder, towels wrapped around our wet tresses, we would rush to wear our new clothes while amma and athai would help dry and do “pai pinnal”. Not sure how to explain it. It was a style of braiding just three strands of hair so it kept the hair loose without falling on the face and yet gave assurance to the parents that we weren’t running around with our hair all loose. Even as me and V focussed our attention on getting dressed my other cousin and bro would be at the streets with Appa and Thatha bursting the “sampradhaya” crackers. Then it was a fire fest literally with all homes vying for the most amount of paper kuppai in front of their homes. By the time it was 8:00, the sun will be filtering in through the smog making for a lovely sight. People in all their new finery would walk dodging crackers all the way to the temple and back and then it would be time for the customary marundu along with sweets. By 9:00 we would all be ready to go back to sleep. The smell of pandigai samayal would fill the house. The whole day would pass by in a daze and we would be eating vadai and payasam till late evening and feeling sad the festival we waited for over weeks went past in a blink of an eye. I know how K and I will be celebrating Deepavali this Monday. A spot of oil washed away with shampoo. A customary sweet either made or bought, memories of firecrackers and a whole lot of nostalgia. Happy Deepavali to all of you and Iniya Deepavali Nal Vazhthukal for those who follow tamizh. I did not have the pleasure of growing up in a large family but I sure did love it growing up in a colony 🙂 The competition of who would fire the first cracker and wake everyone else. Iniya Deepavali Nal Vazhthukal to you and K as well. Hey Wishing you and Kannan a very very happy Deepavali. Stirred a lot of good memories there.. Happy Deepavali to you and K.
Hey, Happy diwali….oops…deepavali to you and K bhaiya! Very nice post….love your ‘nostalgia-filled’ posts! Happy Deepavali to you and K!!! Have a wonderful deepavali to both of you. Wish you both a very happy deepavali.I also like to address the fesival as deepavali.I love the new dresses,sweets part of the deeepavali but hate the vedis.I used to be scared of the vedi sounds.I would put cotton and two fingers in my ears the whole time someone lights vedis.But i love to see all the flowerpots and chakrams even if i won’t light them. Wish you and K a very very Happy Deepavali. Ur post brought back nice memories of the past. Sigh! @Apar: Lots of changes from when we were growing up right? Hope aakash remembers the good times years later. 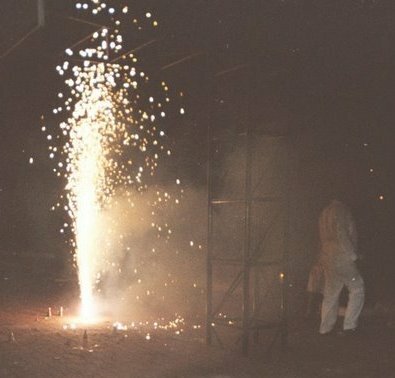 @Mitr: Hope you had a good Deepavali too! @Suman: Thank you. Hope you had a good festival too. @Spillay: Thank you. Hope yours was fun too. @Akay: Thank you. I know you had a nice time making mysore pak. @Shy: Thank you! Hope you had a nice festival too. @Mads: Thank you! Your post touched me so much. @Anila: Hope you did not get too scared this time being in desh. How was it there? @Laks: Most welcome. I almost feel like I am recording my memories for myself to read years down the lane and remember the happiness that was childhood. @Anamika: This weekend should be fun. Lets talk about this when we meet.